Jammu(PTI): As many as 2.55 pilgrims have paid obeisance at the cave shrine of Amarnath in south Kashmir hills, while another batch of 709 pilgrims left Jammu for the Himalayan shrine today, an official said. The yatra commenced on June 28 from the twin routes of Pahalgam in Anantnag district and Baltal in Ganderbal district. 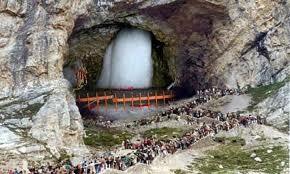 “On the 31st day of the yatra, 3,360 pilgrims paid obeisance at the holy cave. Till date, 2,55,356 pilgrims have had darshan,” the official said. As many as 709 pilgrims today left for the Amarnath cave shrine, he said. The yatra is scheduled to conclude on August 26, coinciding with the festival of Raksha Bandhan.